We can never deny the fact that there are many people who already experienced transferring from different homes in different places. With that we can say that this is not convenient for the family to adjust in different places with different culture. Today we will see how the homeowners of this house who had lived in eight houses in ten years because of their work. Until they finally searched a 3.14 acre lot in Mandeville Canyon. 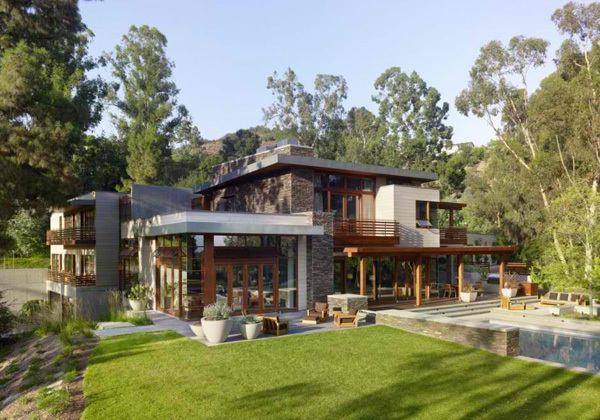 This house was named after its location as Mandeville Canyon Residence. The homeowner was attracted with the stunning views of the city and the oceanic views. 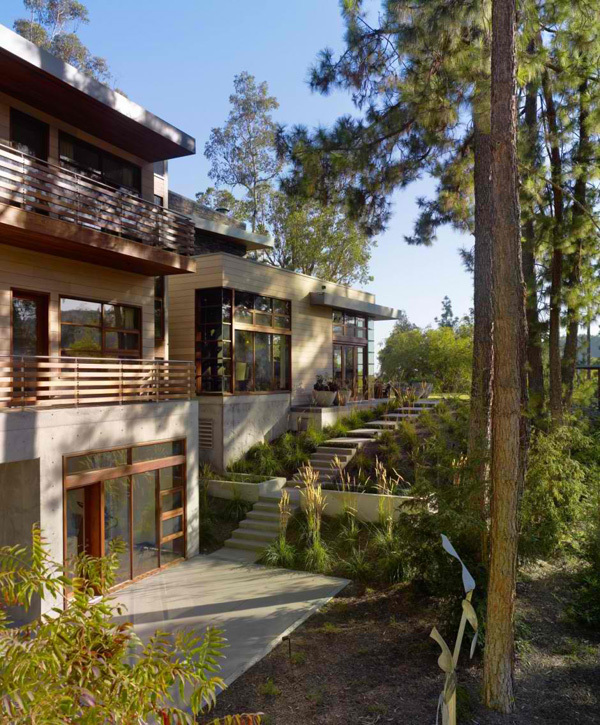 With over 200 mature trees and plants in the surroundings the homeowner considered that they had found the ideal environment for his family. The spacious area in the exterior provides them a greater opportunity to wander all over the place safely. Now let us see more of the different astounding spaces of this house through the images below. 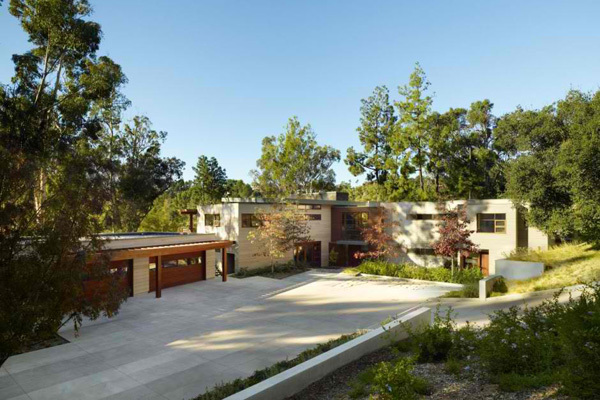 With the elements of concrete, wood, and cement this house stands out in the middle of these green features. 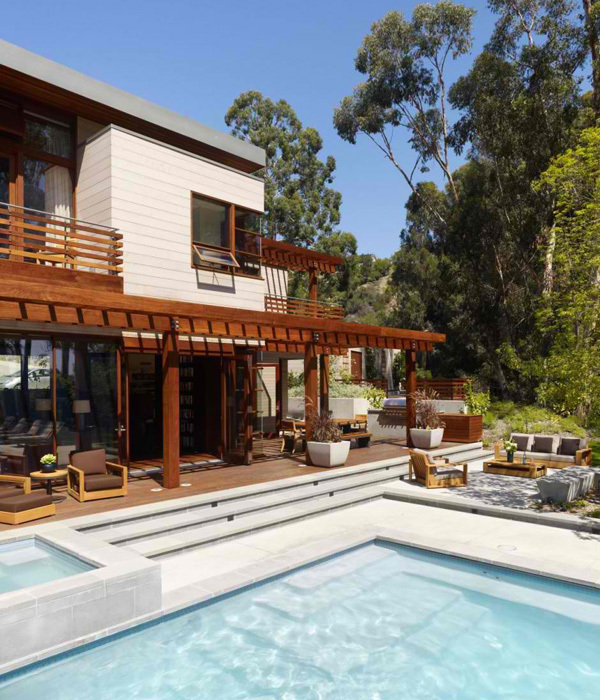 See the spacious area of the house proudly presented with trees and different kinds of plants. The main entrance is also surrounded with these green plants that perfectly jive with the wooden materials used here. 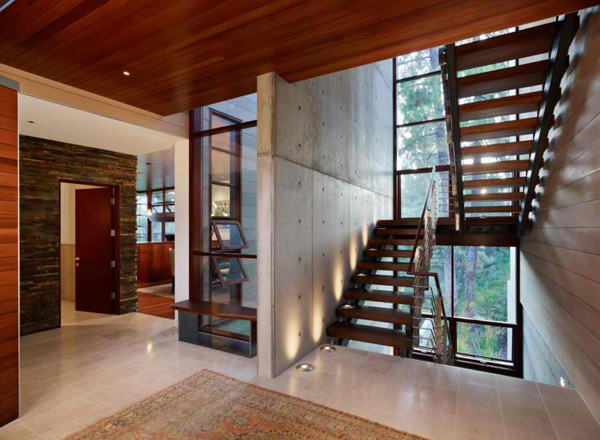 Concrete staircase designs allow the homeowner to enjoy the spacious zone in the garden. Fashionable sofa set are arranged well in the pool area to let the client experience the stress-free area in the house. Traditional wooden materials utilized in the walls and ceiling of the interior exposed a contemporary look. Obviously the rough and smooth texture are effectively combined in the materials and furniture used in this living area. 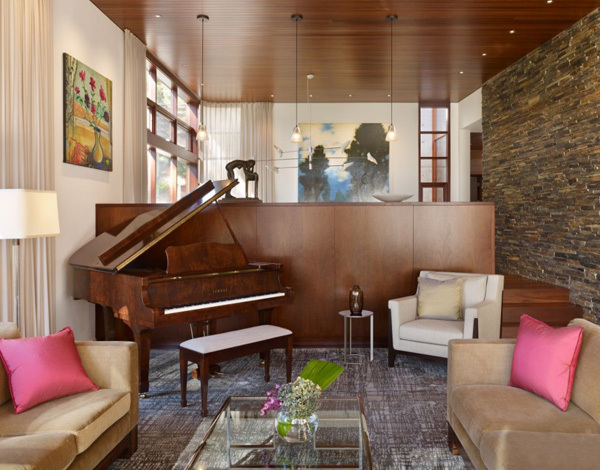 A vintage piano clearly explains the concept and stylish design in the living area. 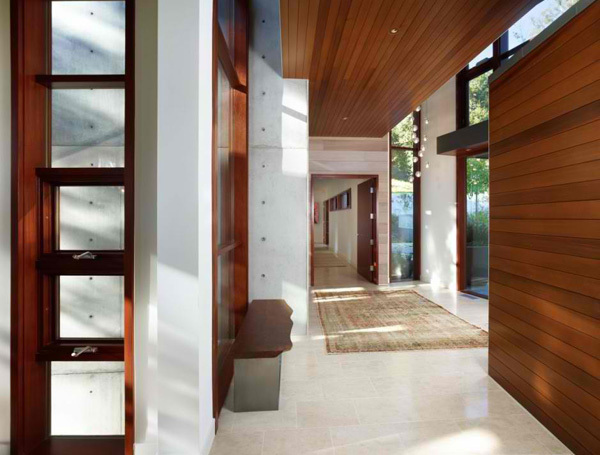 Openness are experienced from the interior because of the large floor-to-ceiling glazed wall and doors. 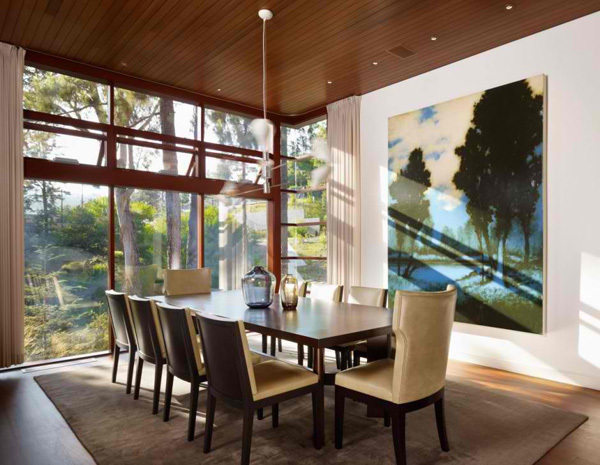 Beige and chocolate brown palette of the chairs in this ten-dining-seat set complements with abstract painting in the wall. This wooden wall is re-invented into a shelf of books that serves as the library area for the homeowner. LED lights are installed in the staircase to emphasize its charm and importance in bringing the client to the different levels in the house. 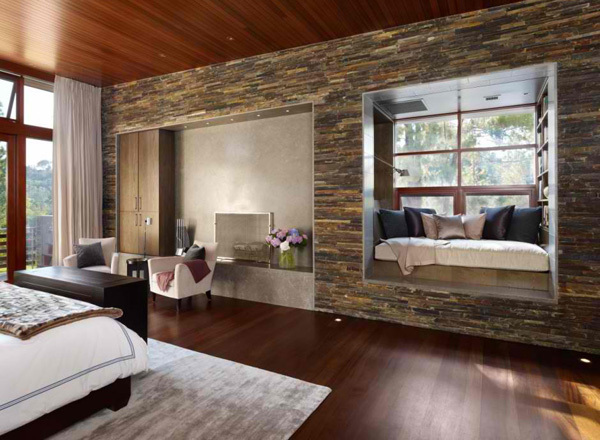 Who will say that this master bedroom is not enough to witness the stylish design and comfort? 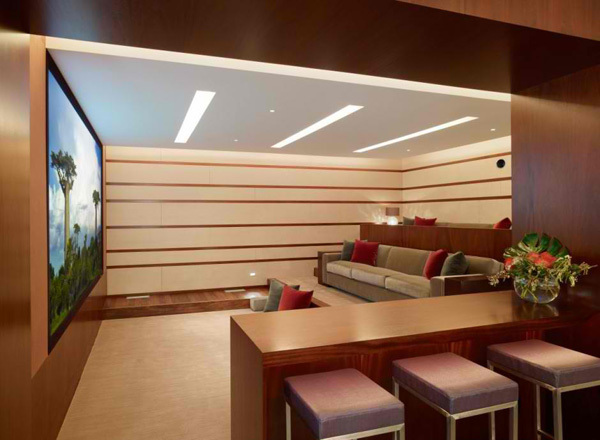 Lights installed in this spacious area for entertainment uncover the trendy and luxurious furniture. White concept of this bathroom is also effective in making this area hygienic and spacious. 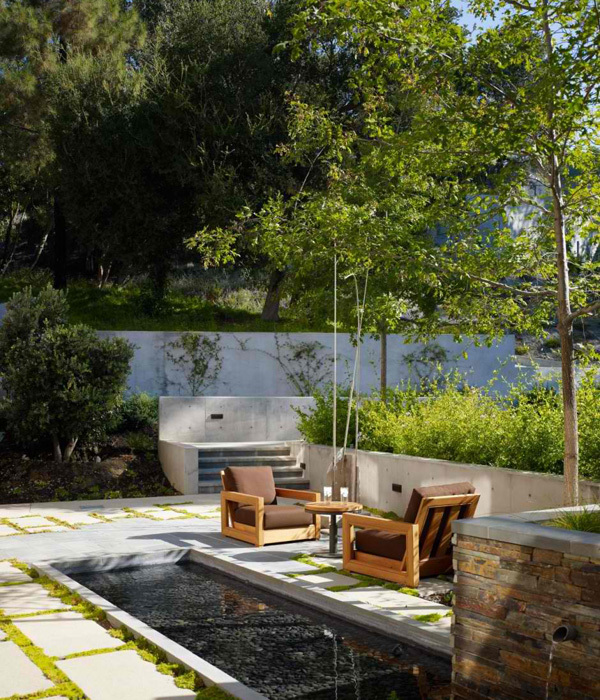 A small pond of koi is designed in the pool area to enhance its ambiance. For weekend picnic time of the family, this wooden bench and table are enough to let them feel the comfort in the natural surroundings. 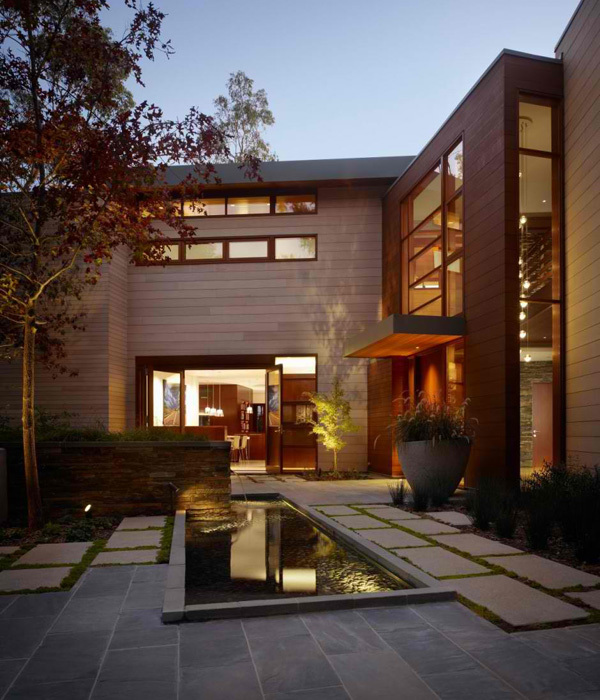 Cool and fresh water in this rectangular swimming pool augment the significance of this exterior. At night, the interior seems like sparkling in the dark for its well-lighted interiors. Pool lights in this huge swimming pool are enough to highlight the luxurious spot in the house. 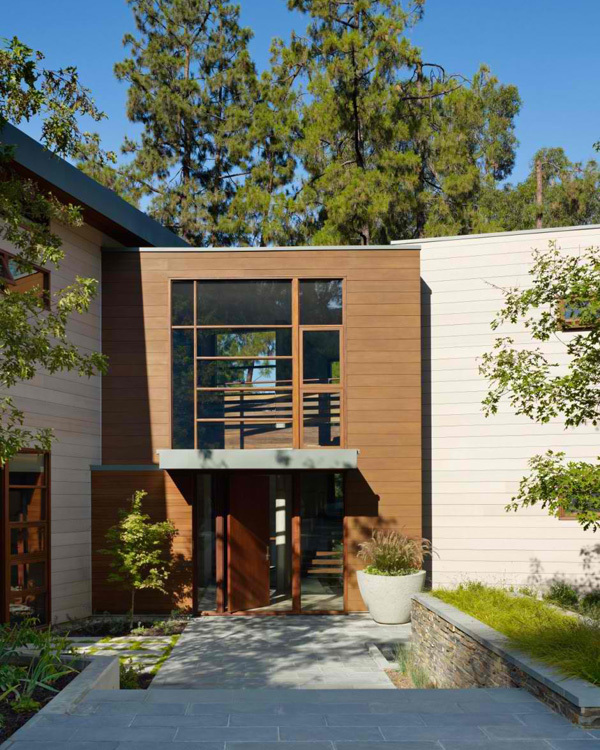 Through the images above, we can perceive how this modern residence gives respect to the craftsman architecture during the early years of 1900s. With its original and simple form, use of natural materials and the image of handmade details, the house stand out among the other house designs in the neighborhood. As a whole we can say that the Rockefeller Partners Architects took the full advantage of the remarkable views and locations while allowing the experience the strong connection of interior and exterior. We hope that once again we inspired you with the details of this house design.